We hosted my son’s rehearsal dinner at Wash Park. Todd was accommodating and allowed us to make a new addition as a food vendor. The space easily fit our group of 80 and they had tables, options for rentals for our tablecloths. We could use our phone with their sound system, their lighting was beautiful, and they helped us to put together a really nice event. They had someone available throughout the event if anything went wrong (we needed some lighting adjustments and some help with the temperature). I highly recommend the facility. Lots of neighborhood parking, bathrooms were clean, fireplace allowed for nice ambience. It is located in a neighborhood so noise can be an issue for them, but for our event it was fine. Thank you Todd and Tyler! Five Stars for Wash Park Studio! I was looking for a venue space to host a very intimate workshop, and Wash Park Studio was perfect with it's fireplace and kitchen set up. Todd was so accommodating and very easy to work with. I loved the flexibility we had to create the space that was best for the workshop. We really enjoyed hosting our wedding reception at Wash Park Studio. The space is great and well set up. Since there were ~100 people, we opted to use the outdoor area and basement lounge which were great adds. Sound system really puts out the jams (though since it's a residential neighborhood volume has to go down a little at 10pm) and the accent lights change to the beat which was really cool. We got compliments all night on the venue and wouldn't hesitate to host another party here! I recently hosted an event here and it could not have gone more perfect. The venue is absolutely beautiful and Todd, the venue manager, is so helpful and accommodating. We had guest commenting on how nice the venue was. A huge bonus is that they have AV equipment, tables, and chairs already onsite. I highly recommend this venue! My wife and I just celebrated our wedding last week at Wash Park Studio and it was AMAZING! Todd was awesome to work with and so many guests raved about how beautiful the venue was. The venue has an urban, industrial vibe that is so inviting and suits a party so well. Truly, we cannot be happier with how our wedding went and all of the help that Todd provided along the way. You will not regret your decision to go with Wash Park Studio! Wash Park studio was the perfect venue for my Business Event. The Space is beautiful and inviting. Street Parking is ample and available. The inside has great atheistic with exposed ceiling, cool lighting overhead and exposed brick. Bathrooms made it easy for clients and overhead music was a perfect touch. Great location, just blocks away form Wash Park. I would highly recommend using this venue for any event! We couldn't have asked for a more magical wedding celebration, and Wash Park Studio was a big part of that. So many of our friends and family commented how the space is so intimate and inviting while easily accommodating 100 people for both the wedding and reception, including dinner and dancing ... LOTS of dancing ... on the beautiful hickory floors with the incredible sound system and perfect lighting. Our catering captain summed up the space perfectly: "It's like inviting people into your home." It really was. And Todd is just wonderful to work with. Really, both the planning process and the celebration were seamless. Todd has created quite a gem here, and, without a doubt, Wash Park Studio will be the first place we recommend to friends looking for an event venue. We had a great experience having our wedding reception at Wash Park Studio. I fell in love with the space when I toured it - it is industrial chic - with exposed brick and twinkly lights up in the rafters of the ceiling. It is a great blank canvas that gives you the chance to add your own decor to really personalize it. Todd was easy to work with and it put my mind at ease that he was there during the event in case guests needed anything or in case anything went wrong. I would definitely recommend the space for small, intimate weddings around 50 people or so. It was the perfect amount of space for us to have cocktails, a sit down dinner and dancing. Wash Park Studio was an incredible venue! My magazine hosted our “Five Under 40” design awards here, and we were thrilled with the entire event process from planning though the end of the event. Todd was so wonderful to work with – always available to answer questions, meet with vendors, etc. The space is very versatile, with beautiful windows and natural light, plenty of parking nearby, and tables/chairs included – all of which made our event smooth and easy, for us and our guests! We heard nothing but great feedback after the event. Thank you, WPS! Wash Park Studios was a great space for our photoshoot. Our crew included 15 people and several participants throughout the day. There was ample space and the building was beautiful and easily accessible. The windows allowed for beautiful natural light and the space felt very warm and inviting. Todd was so helpful and easy to reach when we had any questions about the space, which made the entire process run smoothly. We would highly recommend the space to anyone looking! Washington Park Studios is a beautiful, modern venue for any kind of party. Our daughter chose this out of several we had picked out because it is in a quiet location and very bright and modern. We hosted about 70 guests and the size was perfect. Todd was extremely easy to work with and his assistant was there during the entire reception to make sure everything went well. We chose one of the caterers he recommended. and they took care of everything. We were able to decorate the way we wanted and used his sound system instead of a band. I would recommend this venue to anyone. Absolutely AMAZING venue!! My husband and I had our wedding reception here, and it was fantastic. The building is absolutely beautiful. It is very cozy, without being crowded. The atmosphere was warm and inviting, our guests raved about it. Thank you so much to Todd and the Wash Park team for making our wedding reception one that we will never forget. If you are looking for a venue that is classy, stylistic, and affordable, Wash Park Studio is the place. Flawless!! Wash Park Studio was the find of year! After touring spaces that felt so uninviting, or too corporate, etc., it was a delight to find WPS. The team was excellent, the event went off without a hitch and it was such a fun, personal evening. Wash Park Studio was a great choice for us from the beginning. Todd was so easy to work with and had some good ideas for how to use his space. The space is warm and intimate - we had 80 people and it was perfect! We used the downstairs for the kids and extra space. My guests really enjoyed it there. We were really pleased with how our reception turned out- and Wash Park Studio really set the tone for the night. It was great! Wash Park Studio is a beautiful venue and the staff (and owner) are awesome. We held a wedding ceremony and reception there for 65 people in late February 2016. Todd (the owner) was extremely responsive to all of our requests for information or assistance with planning. We actually found our caterer from his list of preferred vendors. Although we were concerned with the on-street parking, there were no issues for our Saturday afternoon event. Our guests raved about the venue and kids (of all ages) had a blast downstairs with the the shuffleboard table. We highly recommend this facility for your upcoming event! Wash Park Studios was only the 2nd wedding venue we looked at, but as soon as we walked through the door, we knew it was the venue for us! Beautiful hardwood floors, giant windows and exposed brick walls created the ideal environment we were looking for our wedding. Todd, the owner of the studio instantly made us feel welcomed and took a true interest in us as a couple and the visions we had for the wedding. We wanted to have our ceremony and reception at the same venue for ease of planning. The studio space accommodated our all 100 of our family and friends comfortably with plenty of room to spare. Having the option to rent out the small game room in the basement also added extra room, not to mention great times playing shuffleboard! We cannot say enough about our experience at Wash Park Studios with Todd and his team. I highly recommend it for anyone looking for a beautiful contemporary space with a lot to offer. We would not hesitate to use this venue again for future events! Todd was incredible, and the venue is beautiful! Plenty spacious for our 70 guests, great dance floor, the downstairs was so fun! Nice and cozy for a late fall wedding, everyone loved the location and the space! We are very happy that we made the decision to have our reception at Wash Park Studio! We had our wedding at Wash Park Studio and it worked out great! The venue is a wonderful space, with a very contemporary feel. We had about 65 guests and the venue felt intimate but not overcrowded. We enjoyed working with Todd, who was very helpful and accommodating. He has a good rapport with his recommended vendors and it showed in their punctuation and attentiveness. He and the caterer knew the space very well and gave us good suggestions concerning setting up for the ceremony, cocktail hour, dinner and dancing. We highly recommend Wash Park Studio! Wash Park Studio was so fantastic! The staff & ambiance created was exactly what we were looking for! I would HIGHLY recommend this venue! If you are looking for a venue that is modern, intimate, and great to work with - this is your venue!! This space was so PERFECT for our wedding reception! We had about 50 guests and the place still had enough room to dance and move about without feeling stuffed. This venue really is magical! It's surrounded with large windows, wood floors, and exposed wood ceilings that is lined with lights that really set the mood for our receptions. I just LOVED how the possibilities were endless when it came to decorating! It's such a modern space, but yet so imtimate - which is what we were wanting. Seriously the space is BREATHLESS! The owner, Todd, was also sooo AMAZING to work with! From the beginning he was knowledgeable on vendors and answered every question we had in a timely manner. Our company Holiday Party was a smash!!! A BIG thank you to Todd Droy at Wash Park Studio and his team. The venue was warm and cozy yet provided room for people to dance and enjoy a fun filled evening. Thanks Wash Park Studio!! Wash Park Studio is the perfect place for a private party. It is warm, cozy, clean, and Todd and his crew went above and beyond to make sure we were fully taken care of. The space itself lends itself to a night of long dancing, laughing, and nice conversation. It is equipped with beautiful hardwood floors, a warm fireplace, and a downstairs lounge with shuffleboard. The lights that they have set up upstairs really set the mood for whatever it is you are trying to do. I HIGHLY recommend Wash Park Studios for anyone looking to have a great night with awesome people. Ours was an out-of-town wedding and Todd was a fantastic host. The night went off without a hitch and we were SO thankful to Todd for it. He was genuinely excited for our event, he helped us find excellent caterers (Occasions) and was extremely flexible with our very unique New Years Eve reverse-wedding extravaganza. We hired a designer to make up the place, but Todd also had several excellent resources available (beaded curtains, splash lighting, tables, etc.). Todd is also well-versed in the details of wedding planning and went out of his way to make sure we had everything we needed and on-time the day of. I would recommend anyone looking for a beautiful, simple, modern venue to check out Todd's studio. I couldn't have asked for anything more perfect! This was a great space for our company holiday party. It was the perfect size and allowed our guests to mingle in an intimate setting. The coordination/organization of the space really helped ease the planning process. We had our wedding at Wash Park Studio. We loved the place and every interaction we had with them. I worked very closely with Todd, and he was awesome. We planned our weeding in only two months, and Todd was great at helping us find the right catering company, cake, and every detail for our special day. I would highly recommend Wash Park Studio for your next event. Todd was very easy to work with, has a great list of vendors, great suggestions,& Wyatt was an amazing help the night of our party! Wash Park Studio is great! We had our wedding reception there on 9/20/14 and it went wonderfully. Todd is very responsive and helpful which I really appreciated during the wedding planning process. We met with him a few times prior to the big day and each encounter was pleasant, friendly and organized. The space is perfect for a smaller intimate gathering and the location is great too. The exposed brick walls and wood beam ceilings make a great backdrop for any party! Highly recommended! This gem in Washington Park is a beautiful setting for special events. I hosted a birthday party with 90 guests where we had cocktails, a dinner buffet and dancing. I wanted a location where we could bring our own alcohol and outside catering but wasn’t willing to sacrifice an interesting, inviting space. In addition to the loft-like, clean and contemporary design, Todd has equipped the Studio with gorgeous lighting and a terrific sound system and both can be adjusted to accommodate everything from mellow cocktails to riotous dancing! From start to finish, Todd was a pleasure to work with. He is responsive to both email and phone calls. He and his staff were available to us on the evening of the party and even helped negotiate adjustments with the caterer after the event. Do not hesitate to book your event at the Wash Park Studio. Just recently had my wedding ceremony and reception at Wash Park Studio on November 9, it is an amazing venue. We had a smaller sized wedding about 50 guests and we felt like this was the perfect place for us very unique and intimate. The owner of the venue Todd, is a great guy and very easy to work with. We couldn't have picked a better place to have the wedding it was perfect. Wash Park Studio is full of character a wonderful spot to have a celebration, party, wedding, etc. We rented Wash Park Studio for our annual client appreciate event. The space is not only beautiful and modern feeling but it’s also warm and cozy. The lighting and sound system were perfect and everyone had a wonderful time. Todd and Wyatt were great to work with. We will definitely use Wash Park Studio again. We held our wedding and reception at the Wash Park Studio. Being Wash Park Studio's first gay wedding, we were slightly hesitant about booking. A few weeks passed and we decided to go with Wash Park Studio based on the space (wonderful brick, wood bean ceiling, lights, skylight, bar, and sitting area) and our interaction with Todd. Although we were nervous, the venue was FLAWLESS! I highly recommend Wash Park Studio for your celebratory event! 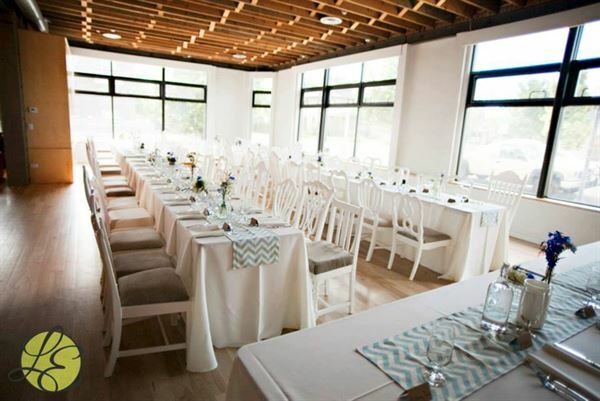 We held our wedding rehearsal dinner at Wash Park Studio in June 2014. The space is fantastic! Todd, the owner, & his staff are incredibly friendly, easy to work with and professional. I highly recommend the venue for any event. Wash Park Studio was perfect for our summer wedding in July! We loved it from the first time we stepped into it and are SO happy with the way our reception turned out! We had about 110 guests and they all fit nice and cozy on the main level of the venue. Everyone had room to eat, mingle and dance! I was concerned at first that not having a defined dance floor in the space would cause people to shy away but after the caterer broke down a couple of our dining rounds it was the perfect space for a celebratory dance party - and dance our guests did! We were able to utilize the beamed ceiling to hang floral installations which were gorgeous while still using the small strings of lights that the studio has installed in the ceilings. The ambiance was perfect! My husband and I wanted our reception to feel comfortable and intimate to everyone and the studio creates a perfect "at home" feel with the way it is laid out. The built in kitchen area was perfect for our bar and buffet area - we set cocktail tables in that area as well that allowed people to mingle. Todd was amazing to work with through the whole process - always SUPER responsive! The onsite manager the day of was also very nice, professional and helpful. I would recommend Wash Park Studio to anyone who is looking for a laid back, intimate venue for a celebratory event! WPS is a lovely setting - intimate and warm yet easily accommodated 85 people for my wedding and reception. Todd was easy to work with and quick to respond when needed. What a great place and great support from Todd. We had about 70 people for a 50th birthday party. Great connections with caterers from Todd and tons on flexibility for set-up and planning. Great sound system which got put through it paces. I highly recommend Todd and Wash Park Studio. What an amazing venue! Wash Park Studio was the perfect choice for our fundraiser which hosted about 80 people. The central location, large windows and comfortable setting provided a cozy and fun atmosphere for all to enjoy. Todd was so wonderful to work with. He was very flexible and helped us meet our fundraising needs. Almost as important, he was very interested in our organization and asked many questions. Thank you, Todd, for helping host such a successful fundraiser. We look forward to working with you again for 2015 event! We had our wedding at Wash Park Studio on Valentine's Day and were SO happy with the choice we made to have it at Todd's studio! The space is so hip, warm, and intimate! All of our family members and friends continue to tell us what a great place that was to have our wedding! From the exposed brick to the rafters on the ceiling strung with white lights, it just ended up being so cool. Wash Park Studio was not only very reasonably priced but Todd is also very flexible and helpful! I highly recommend Wash Park Studio as a venue for any smaller event! This was the ideal location for our Wedding! Our planning process began with a sense of being overwhelmed. After some time of getting to the heart and soul of what we wanted our wedding to represent, we knew we wanted the feeling of a home. We wanted family and friends to come in and feel comfortable, welcomed, and most importantly, loved! With the open kitchen space, the couches, the fireplace, and the beautiful lighting, our special day was full of love, joy, laughter, and an overall sense of family. Thank you Todd! Your venue helped to make our day the best! Wash Park Studio was the perfect setting for our intimate 75 person wedding reception! The space is beautiful with exposed brick, wood floors, sound system, lighting and floor-to-celings windows. There are also optional window covers, allowing more or less light in. There is a great space in the basement with barstools and a shuffleboard.Todd is great to work with and is very accomodating. He has a great list of preferred Caterers and will coordinate with Butler Rents for all your rental needs. I highly reccomend Wash Park Studio! Todd's space is really wonderful for an intimate wedding. We had about 75 people and thought it was the perfect size. We used the space for the reception area only, but fit about 8 - 6 ft tables, 5 tall cocktail tables, a DJ and his equipment and even had some room for a small dance floor. The studio is bright and open with a modern loft feel, we loved everything about the space and Todd was wonderful to work with. He was responsive leading up to our event and he was at the studio the whole night to make sure things went smoothly. What we really appreciated was that we could provide our own liquor and catering, which saved us a lot of money. I would definitely recommend Wash Park Studio to anyone looking to throw an event or wedding.